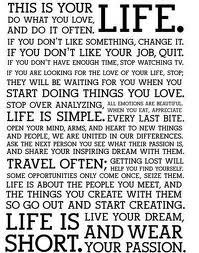 Posted on April 21, 2012 by mimijk •	This entry was posted in inspiration, life lessons, mindfulness. Bookmark the permalink. Love the message…AND the fact that I pushed out out the door! Read this earlier today and loved it. Thx for kicking off my weekend in such a positive way! Thank YOU for stopping by..say hi to your two buddies from me..mine are now choking down breakfast at this ungodly hour (a habit established when I used to commute an hour to work each morning)….